The Great White Life – A first in South Africa. Hello again, if you remember in the first blog entry I mentioned that on my first day with the White Shark Diving Company we were told that unfortunately there were no Great Whites sighted that morning and we went out there were no White Sharks also. The reasons why could have been down to many reasons and the White Shark Diving Company said to myself and the other clients that this can just happen as with all wild animals. It turns out there is a much more unfortunate problem. Wednesday 3rd of May myself and the other volunteers Kasey and Luis got ready for a morning of shore fishing in a local spot for some of the smaller shark species that are local to the SA area. Mary the company’s marine biologist and volunteer director told us that unfortunately a dead White Shark had washed up on the shore that morning and that Dyer Island Conservation Trust (Marine Dynamics) had picked it up and taken it away for dissection. 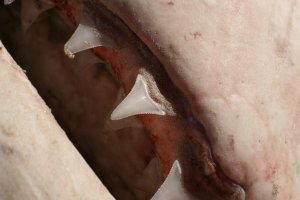 Now since great whites are an endangered species they must be dissected under strict government supervision from the DEA (The Department of Environmental Affairs) and the jaw and teeth have to stay intact. It was decided that the shark would be dissected the next day. The next day we were at the Marine Dynamics HQ in Klenbaai and there was a huge female White Shark (Carcharodon carcharias). On the 4th May I got to witness first hand a Great White shark dissection and it was one of the most fascinating and incredible things I will probably ever see. The animal was 4.9m and it was officially the largest White Shark ever dissected in SA, the sharks name was Khaleesi (named by Marine Dynamics) and she weighed 1,100kg. She was still immature which as a shark over 4m is absolutely mind blowing and myself and the team checked. First, everything was measured; from the total length, down the precaudal and interdorsal measurements, these were all taken as it is needed for future study of white shark biology and research. The dorsal fin was half a metre on its own and the jaw gape was also half a metre in height and width. The shark also had a wound between her pectoral fins which was strange as it doesn’t correlate with many bite wounds. After around 40 minutes it was time to cut the shark open and have a look inside, this was incredibly exciting and fascinating to watch and as the shark was cut open I began to realise that the shark looked empty inside. 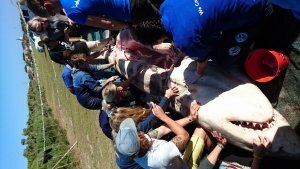 Usually the sharks liver takes up most of the space and it would have usually started to fall out as the team began to cut, then everyone seemed to realise at once that the liver was completely missing!!! My mouth hit the ground as we then realised what had killed this massive female White Shark…..ORCAS!! Orcas have been hanging around SA for a few months which apparently never happens and the crew did mention that whenever the same two Orcas turn up, the sharks leave. The Orcas that have been hanging around are two transient males with dorsal fin collapse (Like Free Willy) and these two animals are known shark killers in South Africa, killing a number of Sevengill sharks in False bay last year. I asked on my first day if Orca (Orcinus orca) and White Shark prey and predator interaction had ever been recorded here and they said it hadn’t, so watching this dissection, I was watching a science and history first in SA. We witnessed evidence of Orca’s killing and eating a White Shark. But how did they manage it? Well the team who dissected it believed that the Orcas would have ripped through the skin into the cavity of the body where it contained the main internal organs, and then simply sucked the liver out like a Frube. So the fact that this animal weighed over a tonne minus its liver is staggering! The heart of this shark was also full of sand, the reason of which is still a mystery. The incredible thing about this situation is that it goes to show that even though Great Whites do have a negative reputation, they aren’t always at the top of the food chain. Even during this sad event we also couldn’t believe the thought of an animal being so clever that it knew exactly how to disable, and eat the only piece of it that they wanted with surgical precision and intelligence. That night as we sat watching a film, the news we didn’t want to hear came through, another shark washed up. This time a 3ft+ male which had an injury in the same place however this time the injury was much larger and open. The same team dissected it the next day and bite marks correlated perfectly with Orca, this further backed up the hypothesis of Orca predation. A theory of a hunting strategy was also found. 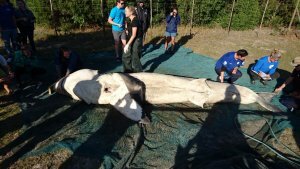 The team believe that a pair of Orcas grabbed a pectoral fin each and pulled outwards, pulling the great white apart allowing them access to the liver. The male shark’s liver was also missing, this time along with its heart. Just as I was writing this blog entry sadly another 4m+ shark has washed up an hours drive down the coast again with all the same injuries and parts missing. In a recent scientific study done by Dr Sara Andreotti it shows that there are only around 350-500 Great Whites left! This is shocking given the fact that this is the Great White capital of the world and these two Orcas are now starting to hunt this already highly endangered population of sharks throughout the whole of SA. The sharks here are incredibly important, controlling seal populations on Dyer Island and Geyser Rock. Without the sharks there is nothing to stop the seals from overpopulating. The seals have already started to eat the endangered African penguin as its easier to eat them than to chase the depleted fish stocks. So, without the sharks you have no penguins, and with such low populations, we could be looking at a pair of animals that could wipe out an entire population of incredibly beautiful and misunderstood animals before we even have a chance to understand them. The sharks are also incredibly important for the area’s economy, so without the sharks a lot of tourism in the area will deplete and the area’s economy will suffer along side it. I am sorry for the not so cheerful entry, even though this was incredible to witness it is also very sad, but what an incredible way to start my two months here in SA and let’s hope that the sharks come back before I head back to the UK. Stay tuned and I’ll see you in the next entry.